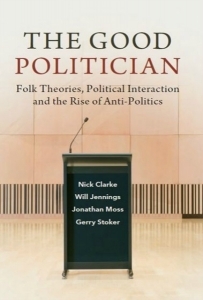 In The Good Politician: Folk Theories, Political Interaction and the Rise of Anti-Politics, Nick Clarke et al offer a long-view account of the growing negative perception of the activities and institutions of formal politics in the UK and consider how citizens evaluate politicians. This is a rich, multi-layered and original take on the rise of anti-political sentiment, recommends Peter Allen, which sheds particular light on the myriad tensions shaping today’s political landscape. The Good Politician: Folk Theories, Political Interaction and the Rise of Anti-Politics. Nick Clarke, Will Jennings, Jonathan Moss and Gerry Stoker. Cambridge University Press. 2018. The Good Politician: Folk Theories, Political Interaction and the Rise of Anti-Politics is a fascinating and multi-layered book. It’s not entirely a book about anti-politics (though it definitely is that to an extent), and it also isn’t solely a book about what people think a good politician is (though, again, it is that in part). Instead, it is a book that takes a second look at the debate regarding what exactly is wrong with politics and politicians. In doing this, it looks at both what people don’t like (what does our anti-politics consist of, and why?) as well as what they do (what constitutes the good politician?). When making judgements about what they don’t like, what they do like and why, authors Nick Clarke et al argue that citizens draw on a set of ‘cultural resources’ that exist within society at any given point. These cultural resources are, essentially, what The Good Politician looks to illuminate. Negative feeling towards formal politics has become held by more people, regarding more aspects of politics, and has become held more strongly (and communicated in stronger terms) (131). Addressing their first major theme, Clarke et al begin by taking a ‘long view’ of anti-politics in the UK (with some comparisons made, primarily with the USA, along the way). Survey data from multiple sources is used to offer the best approximation possible of long-term numeric trends in public opinion. A key aim of this part of the book is to push back against the narrative of ‘trendless fluctuation’ in anti-political sentiment: the idea that there has been no significant increase in such feeling over a 30- to 40-year period. The authors dispatch this notion comprehensively, at least in the case of the UK, by way of a series of dyadic analyses that sees repeated survey questions from the two time periods noted above paired up and compared. Additionally, the authors introduce an original index of anti-political sentiment that allows for a more detailed and ‘thick’ description of these patterns to be given. The rest of the book adopts a mixed-methods approach, building on available survey data by incorporating qualitative accounts drawn from the UK’s Mass Observation Archive. For me, this material is the highlight of the book. At a time when British political science seems increasingly concerned with the top line of the latest opinion poll, it is a brave and resource-intensive move to instead focus your attention on lengthy (possibly rambling) missives written by anonymous members of the public who mail these to the archive on an infrequent basis. It is a decision, however, that pays off. Hearing the voices of these citizens, allowing them to articulate their own framing, raise their own concerns and do all of it in their own words, offers so much more than numbers alone ever could. Some sacred cows are put out to pasture in the course of the book, but not in a grandstanding way. Throughout, the tone is measured and claims are made in an effort to further collective understanding rather than to score some petty scholarly point. For example, the book supports some existing research by establishing relatively clearly that there was no ‘Golden Age’ of British democracy in the post-war period, but it also offers a robust challenge to the ‘critical citizens’ narrative that characterises much discussion of political disaffection in the new millennium. The argument made on this point is that citizens today have more similarities to their post-war compatriots than existing academic accounts allow for. Rather than becoming more critical as such, Clarke et al argue that instead what seems to have happened is the shedding of any reticence in publicly discussing the performance of politicians. For example, while MO respondents in the post-war period often hedge their opinions when asked what they think of politicians (‘this is a difficult question to answer’), by 2014, MPs from all parties (and Ed Miliband in particular) are routinely described in the kinds of terms unimaginable 60 years previous. Crucially, it’s not clear that in doing so modern citizens are drawing on a more developed repertoire of political concepts or ideas; rather, they are just more comfortable with putting their opinions out there. Turning to the second major theme of the book, the authors argue that modern politicians are essentially trapped by the public’s expectations of ‘the good politician’. Although this was still a somewhat precarious balancing act in the past – combining humanity with strength – it is now perilous, as citizens demand of politicians that they are simultaneously ‘normal’ and ‘in touch’, but then are also able to act out this normality in a range of contradictory settings. These include when they are online, when with other world leaders, on TV or when meeting ‘regular’ voters. Clarke et al categorise the traits that respondents perceive as desirable into ‘virtue families’, something that should prove useful to researchers working on this topic in future. A key point of note here is that while examples of these virtues were somewhat easy to find in a single politician in the post-war period, by the early twenty-first century no politician straightforwardly embodies a single virtue, something reflective of the kind of personality yoga the authors claim our leaders increasingly force themselves into. Although the mark sheet for the good politician has never been without contradictions, the authors claim that these are now more marked, and more salient to citizens, than before. Overall, then, the book’s main theme is tension. On the face of it, tension between citizens and politicians, but beyond that: tension between a desire for competitive party politics and politicians who work together; between wanting politicians who are both normal and abnormal; and between being more involved in politics and being led by politicians who can take decisions on our behalf (the authors making a significant nod to John R. Hibbing and Elizabeth Theiss-Morse’s Stealth Democracy at this point). The book sheds new light on all of these tensions and offers an interesting and original take on the big questions they throw up. Anyone interested in the future of representative political systems in Britain and other advanced democracies will find a lot to chew on in The Good Politician. It is accessible enough for the general reader but rich enough to allow for multiple deep, academic readings. It is hard to imagine the book being dislodged as the best account of anti-political sentiment in Britain for many years to come. Peter Allen is Reader in Comparative Politics at the University of Bath. His book, The Political Class: Why It Matters Who Our Politicians Are, is available now from Oxford University Press.